← Getting Your Ducks in a Row: Organization or Procrastination? Why is getting started often the hardest problem that writers face? Today, I piddled around with journaling, reading blogs, watering flowers, some marketing…all the while “getting ready” to write. But by noon, I hadn’t written Word One. There was no real reason for me to be unfocused. I felt fine, ate a healthy breakfast, had a lovely phone chat with my preschool granddaughter about our thunderstorm, cleaned the kitchen and straightened the living room. I was then ready to write…but I didn’t. When I started writing umpteen years ago, I had babies and toddlers underfoot, lived on a farm, wrote a lot, and moved at lightning speed, multi-tasking before it was a word. I had no patience at all with writers like the one I’ve become: the writing procrastinators. Back then, I had no time to procrastinate. If I didn’t write during the hour the kids napped, I didn’t get to write. I was in my office typing within a minute of tucking in the last child. No time to waste! No need to rush about so much now; hence, the problem. So what to do? Thankfully, I’m an avid collector of writing and writing-related books. I knew there was an answer to my problem somewhere on my shelves. And there was! 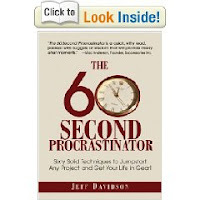 I pulled out a promising title: The 60 Second Procrastinator: Sixty Solid Techniques to Jump-Start Any Project and Get Your Life in Gear! by Jeff Davidson. The back of the book claims that “you can bust procrastination in one minute flat!” It’s a little book, but judging by the turned-down corners and the colored sticky tabs poking out from its pages, it is full of great ideas I’ve used in the past! Lower level tasks? Yard work, email, lunch out, my favorite mystery. Higher level tasks? Writing, marketing, researching, attending critique group. But how do we shift our priorities to those “higher level” tasks? Time for some of those one-minute solutions! I turned to the first dog-eared page, then the next, then the next. I remembered these ideas! They were simple–but they worked for me. While it was tempting to procrastinate and read all sixty of the procrastination-busting techniques, I stopped after three. I put them into practice instead. And wrote. Happily. What about you? Do you have one “tried and true” technique you could share? Well, wouldn’t you know it, I’m in the same boat. Now that I have whole days to write, I can literally waste the day on other things. I just got a package of 5 books and it’s only now that I’m getting to work … but in the middle of preparing for supper, monitoring kids, etc. I usually don’t have a problem with procrastination but I’m recognizing that I am developing it for this particular project … and I don’t want it to become a habit. Thanks for the book rec. I have ordered a copy. And oh, sometimes it is the sheer disgust of a wasted day that makes me go to my desk. Vijaya, your last line is a doozy. “The sheer disgust of a wasted day…” Yup! And then we go to our desks, only have half an hour to work, and manage to get a ton done! And we wish we’d started so much earlier… I am constantly intrigued by the fact that we have such a hard time starting writing when we actually love it–once we get started! I think procrastination and perfectionism go hand in hand. When we only have a short time to get something done, we’re more focused on writing “something” rather than the “perfect something.” I know that’s how it works for me. Too much time to write makes me feel it has to be really good writing, rather than good enough writing that can be edited later. That is fascinating to me, since for me it is just the opposite. We’re all so different! When I only have a short time to get something done, I feel the pressure to get it right the first time. When I have more time, I think, “Just get something down, and you can revise it later. There’s plenty of time.” It just goes to show that we really need to know ourselves and our own thinking! Your morning sounds just like mine–except that mine includes some FB and FreeCell time, too. I’m definitely going to check out Davidson’s book. I will have no serious distractions on my plate by next Friday (a freelance gig will be sent off and the marks for the courses I taught this semester will be in.) I have a book to finish writing and another to edit. I definitely need some strategies to stop me from wasting the wonderful gift of time that I will have starting then. Who knows how long it will last?